Just 2 months after the iOS release, we are proud to announce that our web conferencing software, ISL Groop, has just become a complete cross-platform solution for businesses. We have introduced support for the last major operating system in line, the Android. ISL Groop now enables businesses to spontaneously conference from anywhere on a device available at the moment (PC, Mac, Linux, iPad, iPhone, an Android device). Get ISL Groop for Android for free on Google Play. Inside a web conference, regardless of the version participants are using – the Windows, Mac, iOS or Android, high quality video conferencing and live content sharing craft a smooth meeting experience. While high-level business meetings require at least one person on a desktop computer to moderate the content of the online event, mobile collaborators can easily create a new meeting, invite people and actively participate through a video conference and text chat. ISL Groop Web Conferencing from a desktop computer (Win, Mac). •	Hosting and joining an online meeting or a webinar. •	Inviting participants easily via email or message. •	Text chats; public and private. •	Sharing an application, a region or the whole desktop (Win, Mac). •	Creating slides from PowerPoint and screen clipping (Win, Mac). •	Interacting on slides with whiteboard tools (Win, Mac). •	Sharing files (Win, Mac). •	Recording meetings (Win, Mac). 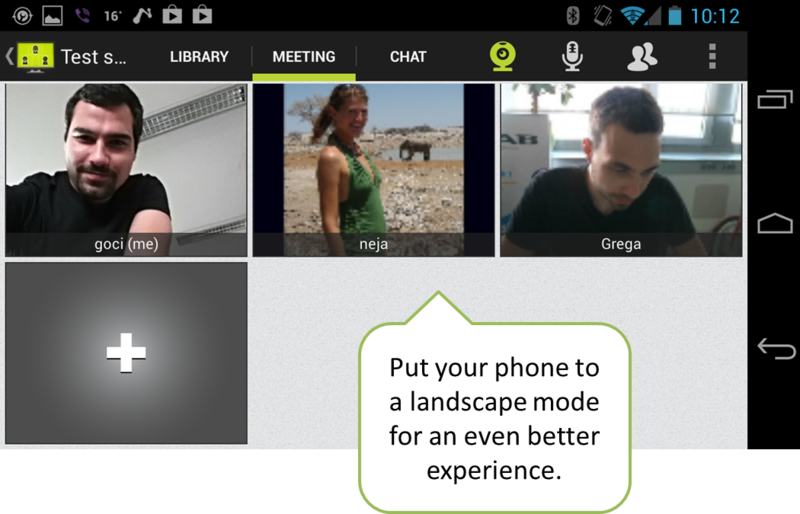 Let’s take a quick look at the short graphic instructions that will help you master web conferencing on Android. But first, take your mobile and get ISL Groop for Android on Google Play for free. Step 1 – Sign up, log in: Sign up to create an ISL Online user account (new users) or simply log into your existing account (remember the all-in-one pricing policy?). 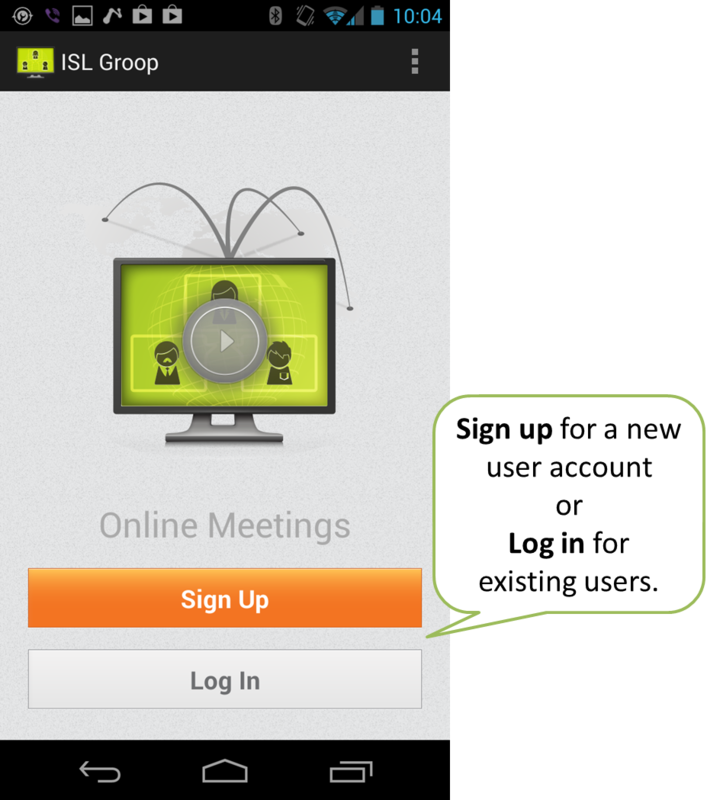 Step 2 – New meeting: If you are new to ISL Groop, then you’ll find an empty list of meetings when logged in. 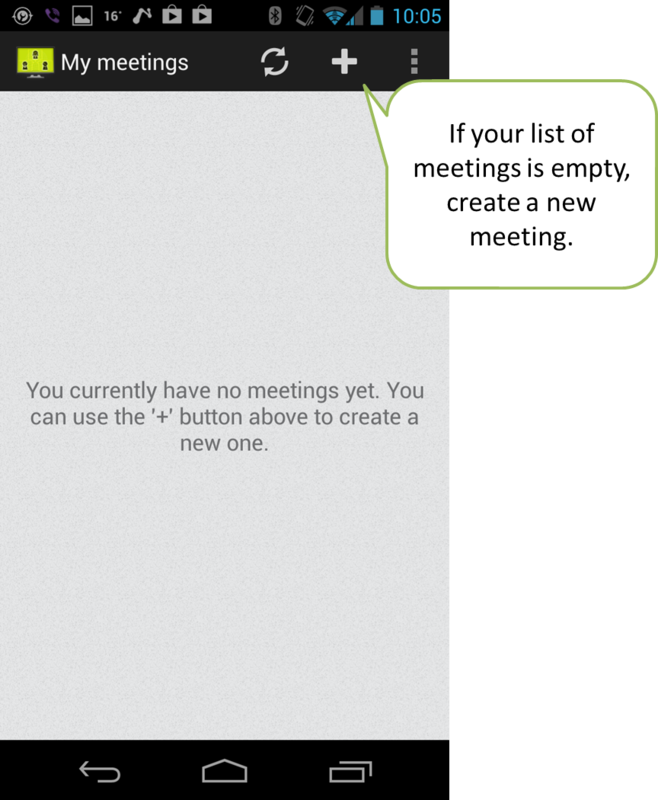 Create a new meeting by simply clicking on the ‘+’ button. Step 3 – Meeting title: Give the new meeting a meaningful title since it will be displayed in the application’s most visible top title bar. Once created, the meeting will be listed under ‘My meetings’ by its title. 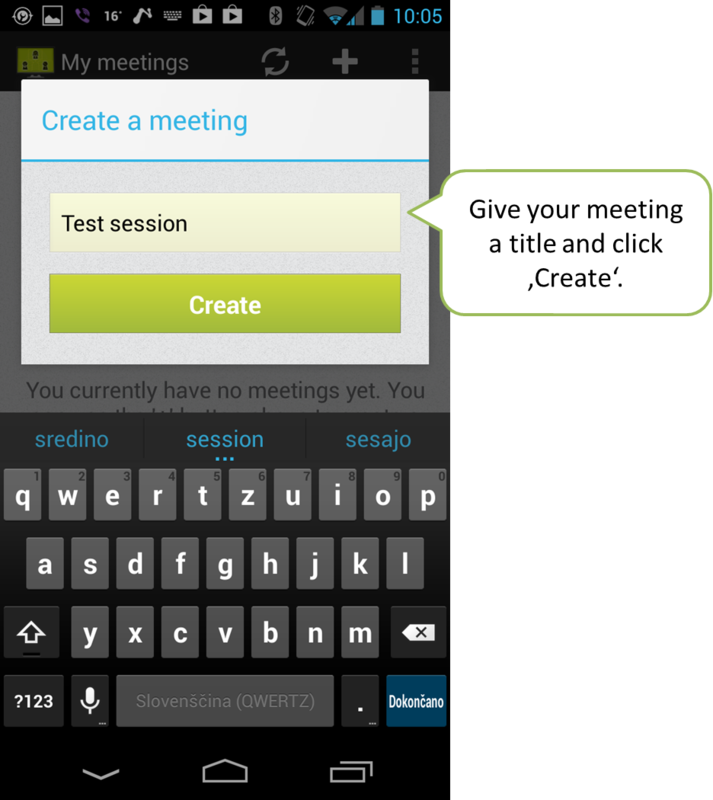 Step 4 – Join and invite: To join the meeting, click on its title. You can send invitations to other collaborators inside the application or you can click on the pointer on the right and invite others first. 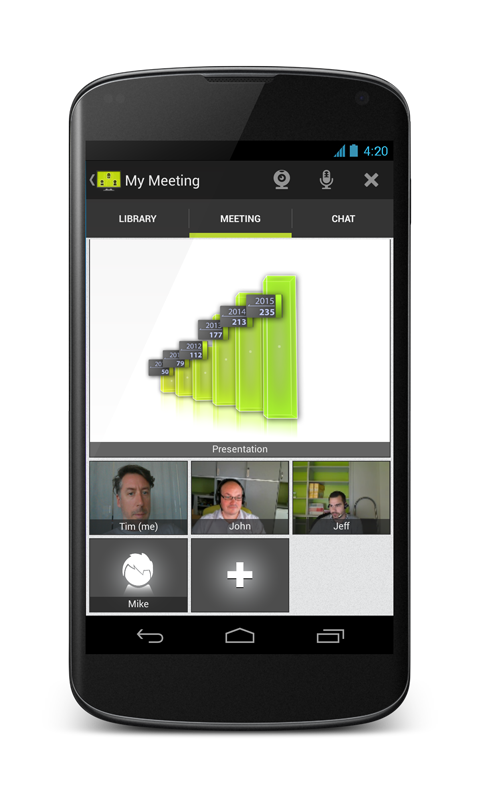 Step 5 – Video conference: Once in a meeting, turn on your camera and microphone to start a video conference with others. Consider turning your phone to a landscape mode for a bigger view of the participants’ videos and the presentation slide. 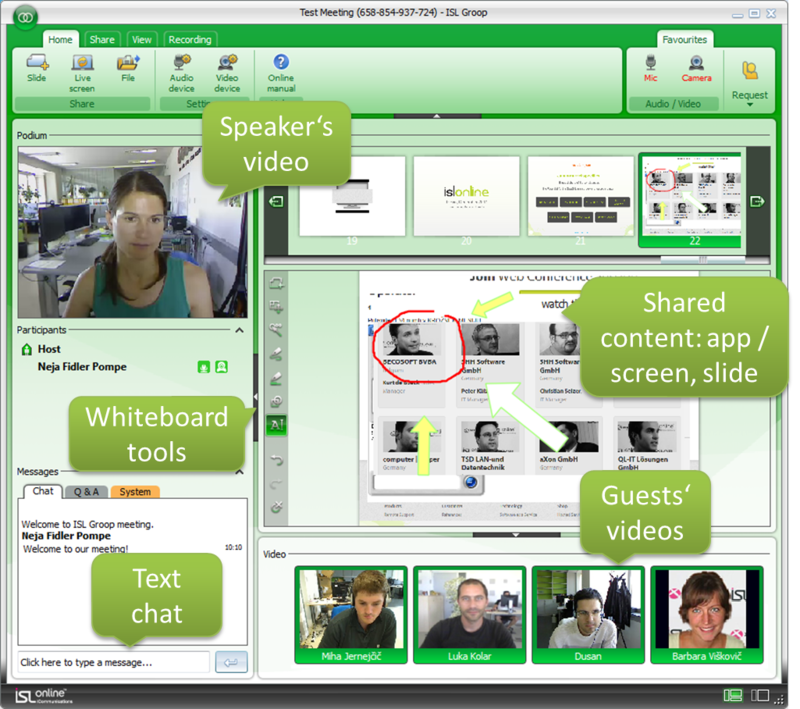 Step 6 – Presentation: Follow the presentation content shared from a desktop computer and interact via video conferencing. Step 7 – Library slides: Open the ‘Library’ tab to scroll through all content slides. 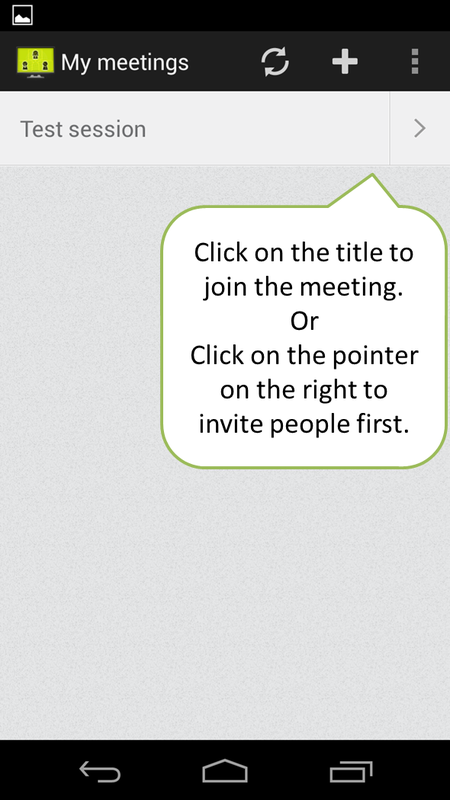 By clicking on a certain slide you can force it to be used in the meeting presentation. 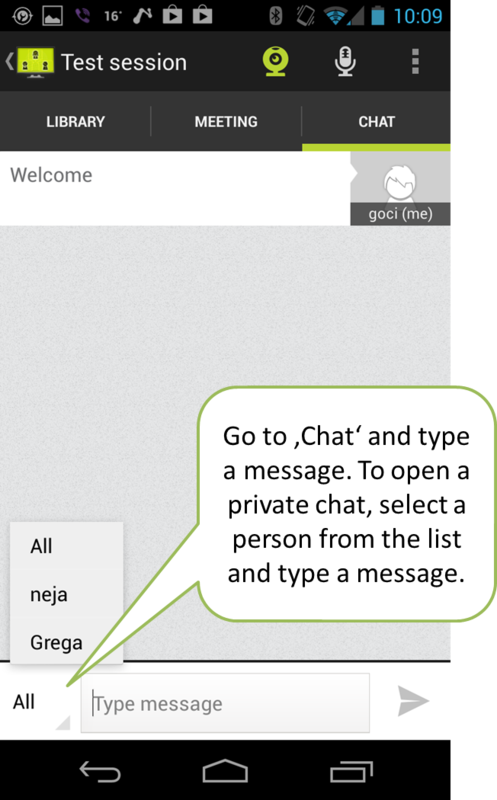 Step 8 – Chatting: Open the ‘Chat’ tab for text chatting with other collaborators. You can send a message to everyone (select ‘all’) or to a certain person (select her/him from the list). Step 9 – Additional options: See additional options by clicking on the button in the top right corner. They will let you switch the camera from front to back, manage participants by muting their audio, open settings and exit the meeting. That’s it! Enjoy your next web conference and let us know how it went in the comments. This entry was posted in Android, ISL Groop, isl online, Mobile, online meeting, Uncategorized, web conferencing and tagged android, business meetings, online meetings, video conference, web conferencing. Bookmark the permalink.